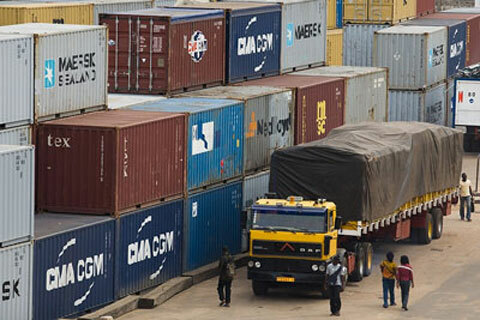 The Tin-Can Island Command of the Nigeria Customs Service (NCS) has intercepted a 40 ft. container with 980 rounds of 9mm type live ammunitions and a pistol imported into the country from the U.S. The Public Relations Officer of the command, Mr Chris Osunkwo made the disclosure in a statement made available to newsmen on Tuesday in Lagos. According to the statement, the Area Controller of the Command, Comptroller Bashar Yusuf, said the ammunitions including a camouflage military face cap, camouflage belt, a pair of hand gloves and a pair of shoes were concealed along with other personal effects in two vehicles. Yusuf said the arms and ammunitions and a suspect who was arrested in connection with the seizure, had been handed over to the Department of State Security Service (DSS) for further investigation. “A 40 ft container with number CLHU452754/2 with these items have been seized and it is with us and we are transferring them as appropriate to the relevant agency. “The items were concealed because nobody can just import these things without full authorisation to do that. “No unauthorised passenger or trader should trade in arms and ammunition all over the world. It is not allowed. “You have to go through due process; authorization with permit, before you move even one piece across the border of another country,’’ the statement quotes the controller a saying The statement said, “The suspect is with the Directorate of State Security Service for further investigation so that we will get the full details of how he came about these items as well as if there are collaborators within Nigeria or outside Nigeria.’’ “It is within their purview to do that,” the controller said. The Officer-In-Charge of DSS at Tin Can Island Port, Mr James Udo, explained the danger such importation could have on members of the public, if it had escaped Customs’ attention. Udo said that security must be a collective responsibility. He said the DSS would conduct further investigation on the importation to unravel those behind it. Meanwhile, the command said it generated N24.8 billion as revenue in January 2016 compared to N20.9 billion collected in the corresponding period of last year. The controller attributed the increase to improved transparency, compliance from clearing agents as well as a robust electronic system.